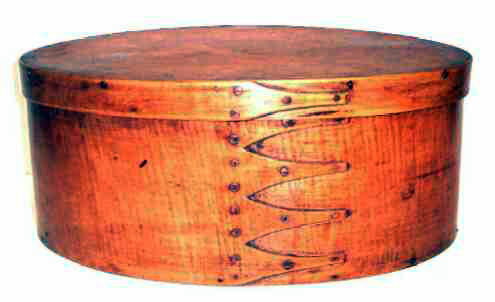 Presented here, a simply wonderful TIGER MAPLE Shaker Box with five swallowtail fingers. The top and bottom are pine. Fastenings are copper tacks and pegs. The condition is outstanding. The size is an impressive 13-1/4" long x 9-1/2" wide x 5-5/8" high. Big, bold and gutsy says it all very well.